Swords clashing, political subterfuge, and shining righteousness—all within the hallowed stone walls of the legendary fortress of Camelot. For as long as I remember I have been deeply infatuated with all of the mythos of medieval fantasies. When I found a passion for board gaming, I was not surprised that I bought a copy of Shadows over Camelot on sight. When I initially played the game, I was ecstatic that the game was well balanced and has a high replay value. 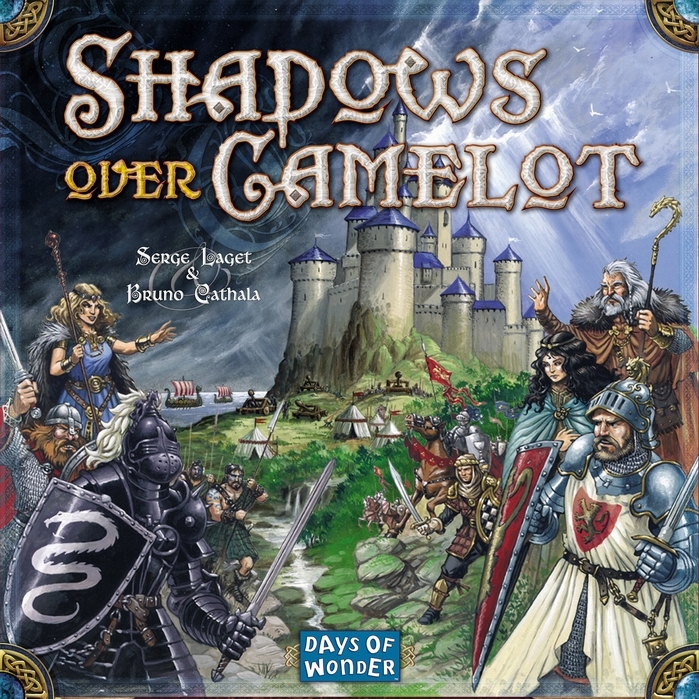 Shadows over Camelot is a three- to six-player game that can take between an hour or two, depending on player count and their experience with strategy games. The game consists of each player taking the role of a knight of the round table—with one person being King Arthur, himself. Each knight has a unique ability to bring to the table (heh—table puns), and with those abilities they strive to complete some iconic quests and bring order back to the realm of Camelot. The way that the knights can win the game—and save the kingdom—is by completing quests and adding White Swords to the round table. If a quest is failed, Black Swords are added to the table, and push the knights one step closer to losing. There are two ways that the kingdom can fall into chaos and cause the players to lose the game: either by 12 siege engines being placed in front of Camelot, or at the time when there are 12 swords placed on the round table, at least six of those swords are black. With the main objective being to restore order to Camelot, there are several individual tasks that must be managed to unify the kingdom. The Relic quests at hand are to find the Holy Grail, claim Excalibur from the lake, and obtain Lancelot’s armor. These quests offer relics that can be used to aid the knights in their future quests. The other objectives that can be repeated—but add fewer swords to the table—are to fend off the Picts, the Saxons, and joust the Black Knight, himself. Relic quests require more effort to complete and yield more rewards for the knights; while the lesser quests are quicker to complete, but do not add as many swords to the table. Each knight begins their turn by going on a quest and attempting to complete it. Some quests, like finding the Holy Grail, can be worked on by multiple knights; whereas quests like jousting the Black Knight can only be done by one person. During each turn, the player must progress the forces of Evil—either by losing one health point, playing a Black card for a quest, or adding a siege engine around Camelot. Each player here is a large amount of influence in this game, which is more worrying knowing that one of the players is. . .a traitor! At the beginning of the game, each player is given a secret Loyalty card—one of which being the Traitor card. It is the goal of the traitor to push Camelot past the brink of destruction and bring it to its knees by triggering one of the two lose conditions in the game. The last action a knight can take on their turn is to accuse another knight of being a traitor. Only one accusation can be made by each knight per game, and these accusations come with consequences. If an accusation is made, the accused knight reveals their loyalty card, and a White Sword is added to the table if they are the traitor; but if the knight is not the traitor, two Black Swords are added to the table. The traitor can also make an accusation, but doing so often reveals the motives of the accuser. Or maybe I get paranoid . . . I love this game. I love figuring out the motives of others, and I love trying to juggle seven objectives and learning to accept small losses to take larger wins. I love playing both as a loyalist and as the traitor. I love over-analyzing actions and causing confusion. The base game for Shadows over Camelot is well balanced and provides years of replay ability. However, this is completely thrown out the window when you add the Shadows over Camelot: Merlin’s Company expansion to the game. 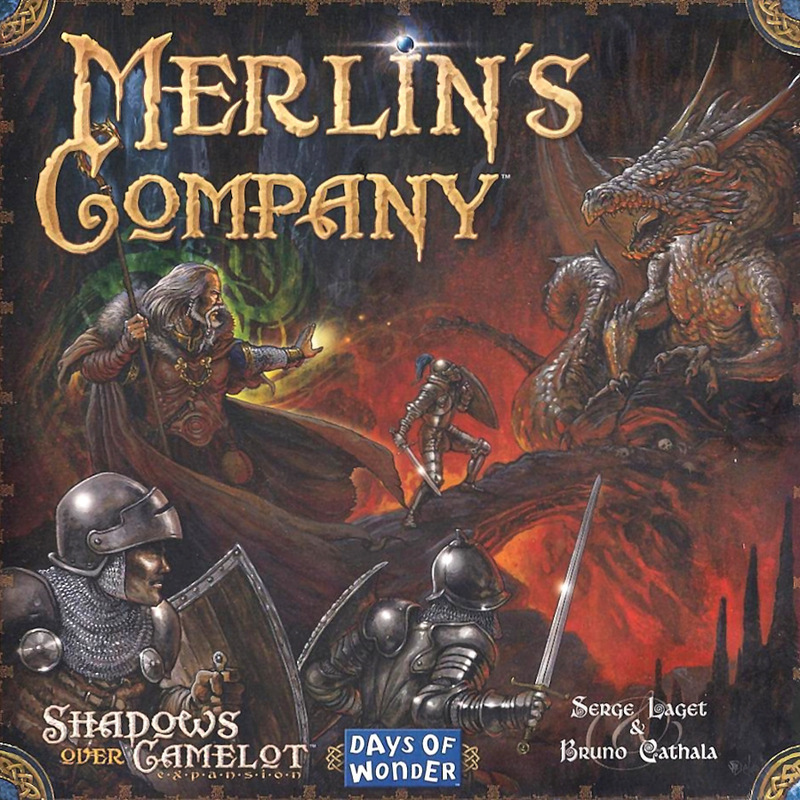 Merlin’s Company doesn’t add a lot to the base game, but what it does add kicks up the difficulty for the game tremendously. The expansion adds a seventh knight and alternate character cards for each knight, which offer a new unique ability for each. The biggest contributions to the game are two features—the Travel Deck, and Merlin. Players are now required to draw from the Travel Deck, which can cause different things to happen to the knight; anything from getting lost, which can cause a knight to end their turn, or getting captured, which requires another knight to use their turn to save them. On the opposite end of the spectrum, nothing can happen (trust me—it’s a blessing), or Merlin can potentially travel with you. The perk of having Merlin traveling with you is that while he is at the same location as your knight, you can draw a free card each turn—something that otherwise can only be done at Camelot. This is especially beneficial, as those cards are crucial to completing quests. Although these additions do not seem major, let me be clear—I bought the expansion to this game six years ago, and I finally beat the game. . .last weekend. I have tried many times to beat this game, and with the expansion in play, the traitor has a huge advantage over the loyalists; and despite these overwhelming odds, I still love this game. It might be because I am a sucker for anything related to Camelot, but although I might not open this game box again anytime soon (I want to savor the hard-earned victory, after all), this is one of my most highly recommended games. I cannot praise it enough; and as an added bonus, since this game has been out for a long time, you can likely find a copy of it and its expansion for cheap. Draw your swords and fight some evil. Good luck!